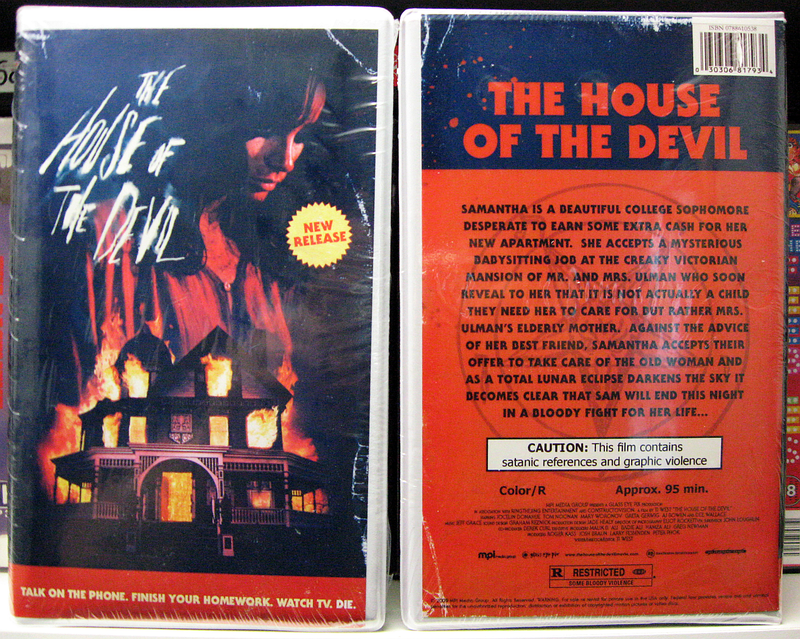 Picked up a second copy of the Gorgon Video/MPI clamshell of Ti West's House of the Devil. Now that is one nice lookin' shelf! I have mine on full display in my living room...I wish they would do this with Machete and or Hobo with a Shotgun....it is good to know great minds think alike when it comes to nostalgia. Great house of the Devil VHS! What is interesting is that all the ones I've seen have a small scrape in the top corner over the barcode - mine does also (and I had two!).... is this a purposefull thing or a manufacturing error?? Yes mine has the scrape too. It's a common thing to indicate it's a promo copy not meant for sale; you get DVDs and CDs like that all the time. Perhaps they did it because the VHS was only available in the combo set with the DVD and not meant to be split up. Does anyone know where I can find a copy of the tape? I have the film on Blu but I sort of need the VHS, need it I say. Someone is trying to get $999 for it on Amazon... wow am I glad I bought it when it came out.